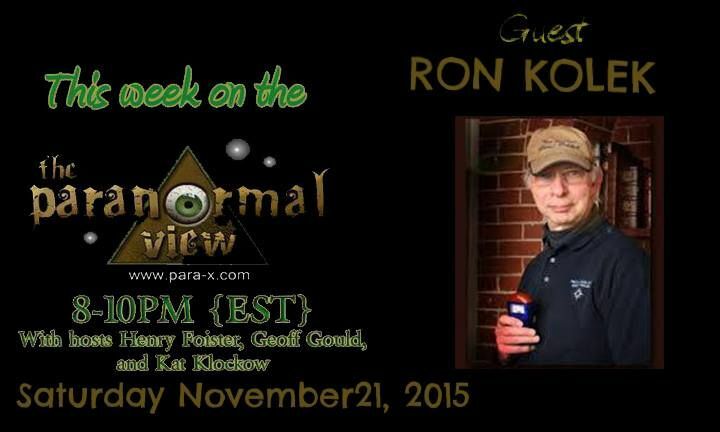 Ron Kolek Tonight our guest was author and paranormal investigator Ron Kolek, who just before the show I learned was a fellow Whovian. Ron started out by discussing his Near Death Experience (NDE), "thanks" to a pulmonary embolism while in hospital after a hand-saw incident, where the saw won. His NDE had him arrive at a bright white place with etheric music, and a strong Feeling of Home. It was overly brief, as he returned to his body. In 1998, Ron went into taking media classes, and decided to create a reality series about ghosts on W-NDS, Ghost Chronicles, as his company he founded was already known to be haunted. He had also gone from skeptic to believer after his NDE experience. Ron also spoke about dowsing, setting up investigation base camp/s and such. His early equipment was almost amusing, such as IR baby monitors, etc. Ceiling Cat Barbara Duncan asked about the distinction between American paranormal investigators and British paranormal investigators, considering Ron's radio partner Steve Parson, as well as working with the Friends of Portsmouth Harbor Lighthouse. He spoke of how Steve loathes the Hack Shack "radio" as an investigative "tool," and an interesting experience where one was providing full sentences as opposed to the occasional word. We spoke at length about various aspects of the paranormal, orbs, investigations, et al. Ron was very pleasant, friendly, and entertaining, taking seriously the subject... while still being a bit tongue in cheek. CC reported our having listeners tonight in the US, the UK, Canada, Japan, Australia, the United Arab Emirates, and Unknown. Ron spoke about trans-channelling mediumship, and how he went from skeptic to believer with some of those experiences he'd witnessed. Henry asked Ron about (and Ron discussed), his New England Ghost Project group, as well as one or two lighthouse hauntings. Ron gave out his neghostproject.com site, and his own ronaldkolek.com website. Ron did not give out his @baronvanhelsing name on Twitter, or his being on Facebook. Kat was absent, so I gave out the show's @Paraviewradio on Twitter, Kat's Jinxed Comic site, which also has a @jinxedcomic Twitter page, along with her @KatKlockow Twitter account, and Kat's own official website. We can be contacted by email, the official show page is at Paranormal View, and previous shows are available on iTunes. 21 November 2015 The Paranormal View.